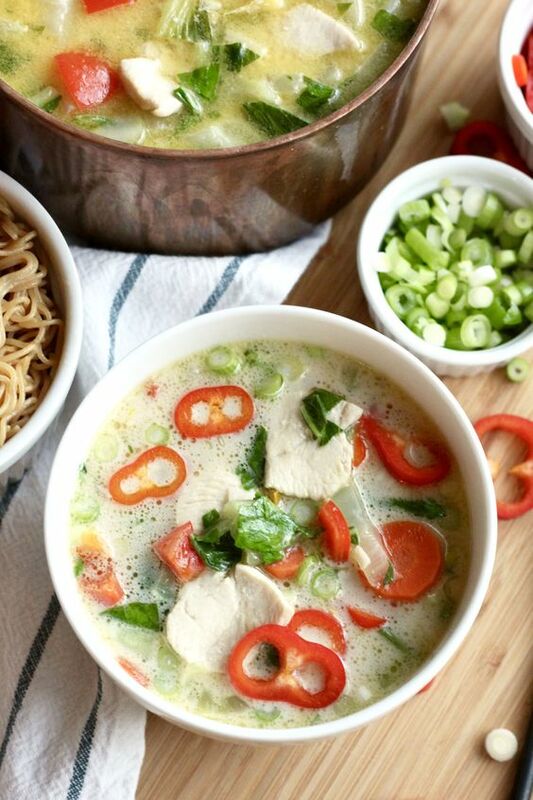 This coconut ginger chicken soup is a favorite for cold winter nights. 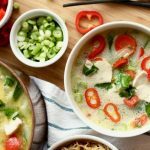 The ginger infused chicken broth with coconut milk is both comforting and hearty, a perfect easy one-pot weeknight meal… especially during cold and flu season! 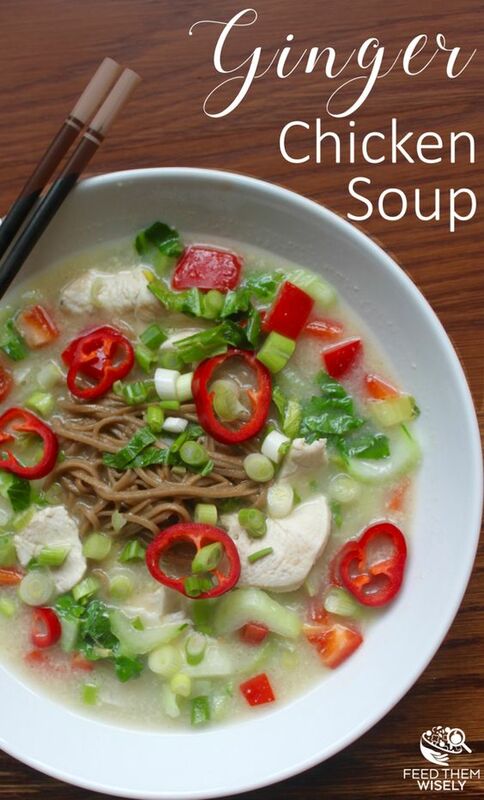 You can serve this delicious chicken soup with toasted sesame soba noodles made with 100% buckwheat noodles to make this soup a little more filling. If you prepare the ingredients for this ginger coconut soup in advance (washed and cut), the soup can be cooked in just a few minutes. Our favorite vegetables to add are red bell peppers, baby bok choy, and carrots. However, you can easily modify the veggies meet your family’s specific tastes. Heat olive oil in a large pot. Add chicken and sauté until lightly browned, about 2 minutes (does not need to be fully cooked). Recipe makes approximately 4 adult servings. Nutrition information is based on 1 serving (with 100% buckwheat soba noodles) prepared with full-fat coconut milk. I try to use coconut milk that does not contain any stabilizers (ie gums or thickeners). The ingredients should simply read coconut milk and water. Trader Joe’s brand of coconut milk is a good option. I choose to purchase organic red bell peppers. Read more on pesticides and produce. Did you know that 80% of the antibiotics sold in the United States are for livestock? That is why I choose to purchase chicken raised without antibiotics. For picky eaters or littles who may be wary of eating new foods, serve this ginger coconut soup deconstructed with the ingredients separated. My youngest would only eat this soup deconstructed when he was a toddler. 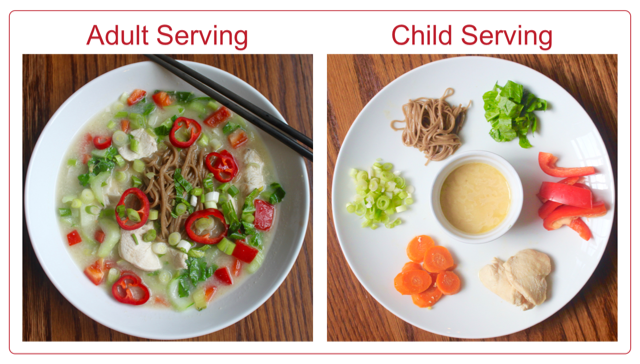 Research from the Cornell Food and Brand Lab shows that children have different preferences than adults for how food is served. Read full article on plating food for kids: why deconstructed meals work. This recipe was originally published in Nov, 2016. The recipe has since been updated with enhanced instructions and refreshed photos. I love the combination of coconut milk and ginger for a soup! This one looks soooo yummy. This soup just sounds so delicious!!! I love the ginger-coconut flavors! Ginger + Garlic are super effective winter healing herbs. They ‘sing’ in this soup. Thanks for a delightful recipe. Will try this one for sure!! Oh yum, this looks so creamy and comforting! Thanks Kari – this soup is super comforting! It is our go-to recovery meal when someone is feeling under-the-weather. 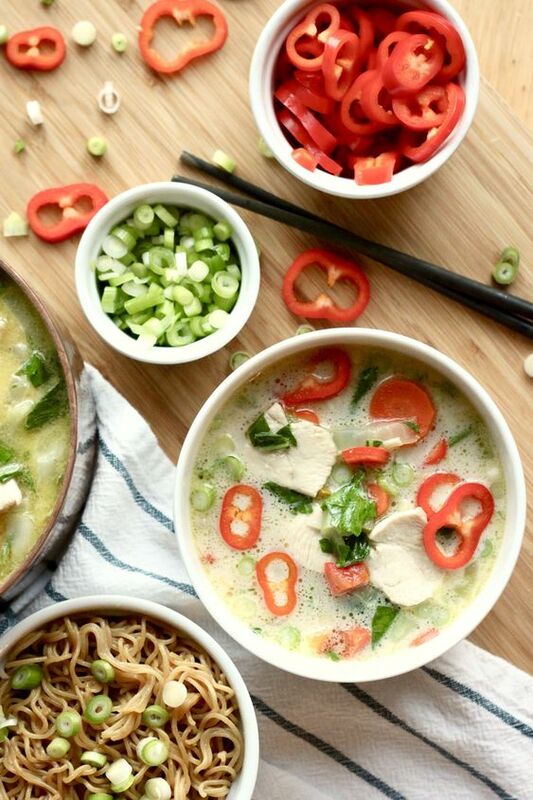 I am getting over a cold and I am craving this soup right now. It looks so warming and delicious! Thanks so much Kathryn! Also, thanks for the heads-up on the broken link to the plating post… it is fixed now! So delicious and comforting!! I love this broth, such satisfying flavors! What a gorgeous soup! I love coconut & ginger together! Thanks so much Chih Yu! This is our go-to cold weather (or cold feeling) soup. We also make an extra batch whenever anyone is feeling under the weather. The ginger and garlic infused chicken broth is SO comforting! Wow! Looks and sounds fabulous! Gorgeous soup, and the flavor looks amazing!!! How gorgeous! I can tell how flavor packed this soup is. Can’t wait to try it! Such a warming and healing soup – I would love this for breakfast! Thank you! I loooove adding ginger to soup. This looks delicious! This looks so good and I love the idea of making a deconstructed soup for the kids. I think adults would find that a fun way to eat as well. Thanks Dahn! You are right! Serving meals deconstructed can also be helpful for adults. I do sometimes serve the whole meal deconstructed (removing the different veggies from the broth after they are cooked) so guests can assemble their favorite version of the soup. I hope you enjoy the soup! This soup contains all of my favourite ingredients and flavours. It looks fantastic! 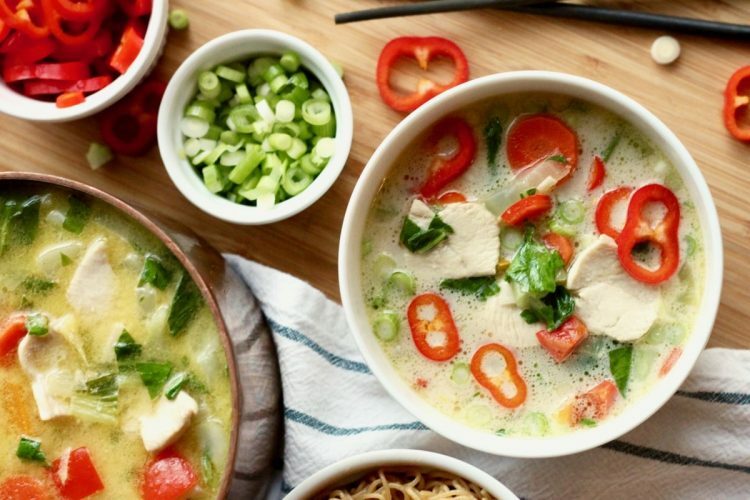 Ooooh this soup has all the flavors I love – ginger, coconut, soy…yum! And I love the child serving idea – that’s so brilliant. My 3 year old is picky about how he eats soups so this is a perfect modification for him. Thanks Chrissy! Figuring out how to feed this soup to my littles was a game changer. It is a family favorite when it is cold outside or when someone isn’t feeling 100%.